The Retribution patch notes are out. There are a lot of changes. A lot of changes. Reading through this document took more than one run. It was easy to miss things or to get so caught up in one point that you missed another. Hence, this little gem, which had not been hinted at anywhere else over the last several weeks and months came to light. This is a very, very bad thing for Low Security Space. I will take a moment to explain why. DED complexes currently come in two forms. The first is a scanable site. These are highly prized by those engaging in exploration. The other is a series of static sites scattered all over the game. These static sites can be found by a beacon in the overview. The beacon is always there. When the beacon is selected you can warp to the beacon. It lands the player on a warp gate which is the entrance to the complex. DED complexes have ship restrictions. 1/10 an 2/10 complexes are restricted to frigates and destroyers. They are meant to be small ship and more entry level content. The rewards are small. 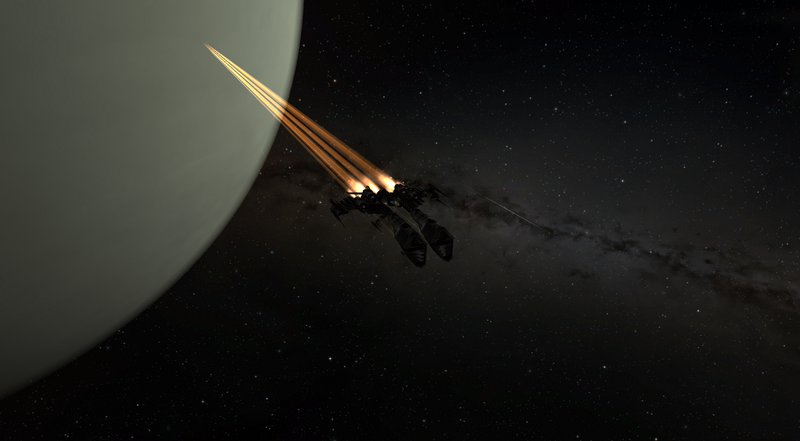 A good day may net a module that costs 20 million ISK. The complex respawns 20-30 minutes after they have been completed. In high security space these complexes are prone to being camped and cleaned out by more experienced players. That is the nature of Eve with any static resource. I believe that the original introduction of these complexes was to help alert newer players to exploration and DED complexes in general. "Hey! What about us?!" What about us? Why would the residents of Low Security Space become upset enough to write a thread on the forums petitioning CCP to leave a PvE option in the area? It is because, like every other group in Eve we use our environment to further our game. I've said again and again that the residents in low security space are there because they want to be there. They also accept the rules and restrictions of low sec. This means, for most of us, that frigates are not something that we fly a lot. But frigate fighting flourishes in some areas and this is why. Static 1/10 and 2/10 complexes. These sites are a focus to low sec small ship PvP. Lets pull up Heild's ship kill statics. Heild has a 2/10 static complex in it and is the home of the Black Rebel Rifter Club. A low sec PvP corp that focuses on frigate fighting. This corporation has build up an entire culture around its static 2/10 complex. They are well known to honor 1v1 fights and to fight predominantly in frigates. The complex itself is a place to go without gateguns or station guns to pop the small ships. The other thing about the complex is that when a ship warps to the beacon they are pulled to zero. For those that do not understand it means that every ship will land at the same spot when they enter. It stops people from dropping in sniping ships to do nothing but feed off of frigate kills. If such a ship were to land the residents will reship into something appropriate and dispose of the idiot. Frigate fighting may involve brawling but it is a decision making process. In a frigate you do not sit at zero and wait for someone to land on you. You create some distance and then when the fight lands a decision making process starts. Landing at zero does not create a disadvantage that a waiting frigate is going to take but instead gives both sides a chance to make a decision. What about large ships? Systems with static complexes are populated. If a large ship decides to go and try to pop a small ship they will quickly find themselves over run and explode in the death of a thousand cuts. Also, the frigate itself will be able to simply leave the situation before the larger ship can orient itself. But the people going to the site are going to the site for the PvP most of the time. hile not all PvP corporations may focus on frigates individual players have different tastes. A static site like this pulls in a steady draw of locals looking to down ship into something fast and fun. Also, it is a prime place of education for new members. Fitting our newest players into T1 fit T1 frigates and sending them off to fight in Heild at a 2/10 complex is a thing. Several of my earliest battles my boys down shipped into frigates and took me there to learn basics in a spot where I would not be instantly destroyed by the other fleet or gate/station guns. This is very much a simple change that will deeply affect the residents of low security space. I believe that CCP changed it without realizing that it would cause Low Sec reaction because no one really knew what we were using the locations for. Now we have to tell them. We have to try to make it clear that PvP is a thing here. We have created with the tools that we have been given. What we have created are arenas of free formed frigate focused fighting in environments inhabited by people that support and encourage this activity in the space. The residents of low sec are a small group. A small group of fiercely independent individuals who chose life in that space because they don't want null sec and they don't want high sec. Low Sec is about small groups and independence and that is what thrives down there. However, the side effect is that we often do not lift our voices loud enough to be heard. I was reading yet another debate about low sec on the Eve Online Forums. To often the people making the idea selections and critiquing the area were not people that lived in the area. More members of high security space and null security space speak up about what they would like low security space to be then the people that live in low security space. There is not enough voice from the members of low security space itself. It is not that we do not have a voice. Oh my, do we ever. We just need to focus it a bit better. Faction Warfare is its own group and has its own Representative and developer interest. Low Sec is not only faction warfare and it should not be interpreted through faction warfare's views and wishes. Just as with the suggested gategun changes we, as the people who actually live under and are affected by these changes have to stand up and speak. It is a fallacy to believe that we are not as much a community as any other group in the game. I can only hope that we will be heard. Good post. It's a strange decision, and likely one that was taken with little or no research. Aye. Like many things the focus is so strongly on what High Sec players do to 'farm' their environment that other uses are over looked and left unseen.